Kick Axe (tonight at the Roxy) brings with it almost three decades of rock & roll history. 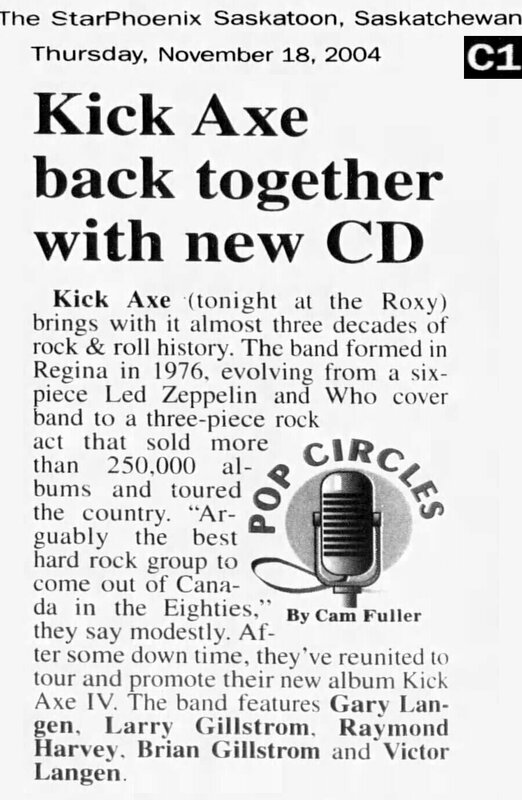 The band formed in Regina in 1976, evolving from a six-piece Led Zeppelin and Who cover band to a three-piece rock act that sold more than 250,000 albums and toured the country. "Arguably the best hard rock group to come out of Canada in the Eighties," they say modestly. After some down time, they've reunited to tour and promote their new album Kick Axe IV. The band features Gary Langen, Larry Gillstrom, Raymond Harvey, Brian Gillstrom and Victor Langen.